A good memory is truly important for anyone to possess. Your memory of faces, names, facts, information, dates, events, circumstances and other things concerning your everyday life is the measure of your ability to prevail in today’s fast-paced, information dependent society. With a good memory, you don’t have to fear forgetting/misplacing important stuffs and you can overcome mental barriers that hinder you from achieving success in your career, love life, and personal life. Your memory is composed of complicated neural connections in your brain which are believed to be capable of holding millions of data. The ability of your mind to retain past experiences in a highly organized manner gives you the potential to learn and create different ideas. Your experiences are the stepping stones to greater accomplishments and at the same time your guides and protectors from danger. If your memory serves you well in this respect, you are saved the agony of repeating the mistakes of the past. By remembering crucial lessons and circumstances, you avoid the mistakes and failures made by other people. Unless you have an illness or handicap, a poor memory is often attributed to lack of attention or concentration, insufficient listening skills, and other inherent bad habits; however, it can be honed and developed using the right methods. Many people believe that their memory gets worse as they get older. This is true only for those who do not use their memory properly. Memory is like a muscle – the more it is used, the better it gets. The more it is neglected, the worse it gets. This is the reason why older people have more trouble remembering than younger ones. However, people increasing in age can overcome this dilemma and can even further improve their memory by continuing their education, by refining their minds, by keeping themselves open to new experiences, and by keeping their imagination working. An important thing to realize is that different people have various ways of learning. The way in which people learn is often a factor determining the subjects they choose to study, instructors they relate to, and careers they select. Memorization or retention of data operates by loading images, sounds, taste, smell, and sensation (touch) in a very organized and meaningful combination in our brain. There are three types of memory. Sensory Memory is where temporary information is briefly recorded. Images such as a picture in a magazine and the design on your customer’s clothing are momentarily stored in the sensory memory. It will be quickly replaced by another sensory memory unless you do something to retain it. Short-term Memory, characterized by 20 to 30 seconds of retention, involves a limited amount of information, and is necessary in traditional processing of experiences and ordinary data gathering (everyday sensation and perception). For example, you were taught by our professor some great techniques on how to easily solve complicated Math problems. The next time you take a Math exam, you may possibly remember some of the formulas, but it’s doubtful you’ll be able to recall and apply all the methods being taught. Long-term Memory involves consolidation and organization of complex knowledge and information for further reference and other cognitive (mental) processing such as the application of learning or information into meaningful experiences. Examples would include your birthday, your father’s name, and your home’s appearance. Short-term and long-term memories are concerned with how you continually organize data that are stored in your brain. In short, human memory is like a vast and complicated yet organized library, rather than a trash can or disordered store room. In order for you to further develop your memory capacity in various tasks, it would be helpful if you consider points and ideas in improving your memory. This would make your retention practices more efficient and sharper. Your brain works as a storage area that stores memory. There are actually two types of memory, short-term and long-term. In your brain, there are various kinds of memory that are stored. Since the brain is so enormous, it requires a system where the memory can be encoded and retrieved. Your brain is required to get information very quickly, regardless of what it is. It doesn’t matter whether the information is old or new. There are some times where the brain cannot retrieve the memory that is needed. Depending on the situation, it could be something that is not a big deal. On the other hand, it could be something that is massive. There may have been times where you have gone to a strip mall and you don’t remember where you parked your vehicle. Or you may have gone to the office products store and didn’t remember what you were supposed to purchase. Maybe you encountered someone that you knew and forgot their name. That can be embarrassing. If you were young when these memory lapses happened, then when you get in your 30s and 40s you may be approaching some senior moments or you may start to forget more. Within 20 years after that, you may be concerned about Alzheimer’s disease. However, this condition has started to creep up in people in their 30s. So it’s not just limited to the senior citizen age group anymore. It’s a good idea to know how your brain operates in regard to your memory. Things such as the birth of your first child, your child’s high school graduation—those are things that you will cherish forever. Those are special moments and it’s difficult to erase the memory. Even if they did not turn out the way you wanted it to, they were still moments that you will never have again with that child. Memory is supposed to be about remembering things that have happened, remembering people, places and things. Memory is not something that you can see. You just know it’s there inside of your brain. The important thing is that there is a place where you can store and retrieve information whenever you need to. 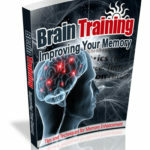 If you are looking to improve your memory, this guide provides some tips and tricks that you can use to start the process. 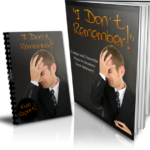 As you utilize them, you can keep information in your memory bank without the embarrassment of forgetfulness.